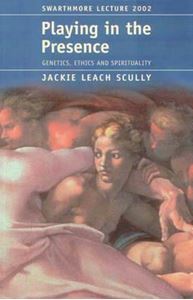 In the 2002 Swarthmore Lecture, Jackie Leach Scully introduces us to the field of genetic research and application, and encourages us to face up to some of the decisions which have to be made. The last half of the twentieth century saw an explosion in our understanding of genetics and molecular biology; the questions now are in what form that genetic understanding will be put to use, and how and by whom it will be controlled. This book is about ethical decisions in genetic manipulations, and about science and spirituality, and how the two are connected. One very good reason for feeling unprepared for the ethical debate about gene technology is that we are unprepared. Part of our responsibility now is therefore to gather information, to work at increasing our own and society’s understanding, rigorously stripping away our prejudices and mistaken beliefs so that there can be more clarity. In an approachable way and with humour, Jackie Leach Scully introduces us to the field of genetic research and application. She engages our attention by explaining with first-hand examples and then by encouraging us to face up to some of the decisions which have to be made.